Jesus or Squirrel? 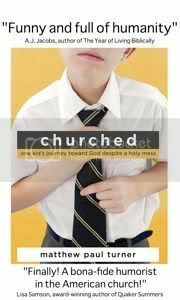 : Who Does Jesus Root For? The National College Championship game is tonight and both the Oklahoma Sooners and the Florida Gators are doing everything they can to win the game. They both have great coaches, storied programs, lots of fan support and Heisman winning quarterbacks. In fact both of these quarterbacks are outspoken Christians, and by outspoken Christians I mean that they are verbal about their faith. So which team does Jesus choose to bless tonight? Does he go with Sam Bradford of Oklahoma (Jesus is known for being a big, 900 ft., Oklahama fan), or does he go with Tim Tebow from Florida who grew up as a missionary kid in the Philippines? From what I have heard Jesus is especially fond of both of them. That in itself, makes both Sam and Tim winners. You too for that matter, even though you can’t throw a football worth beans. By the way, what do you think the caption for the above picture should be? 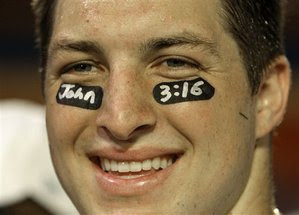 UPDATE: Tebow wins with creative scripture placement. He won on the field too. Jesus is following me on Twitter (http://twitter.com/wwjtweet) and he just sent me a tweet: "Sorry to dissapoint, Jesus doesn't care that much about sports." I think he forgot we captured that image of him wanting to stip the football from the kid and score his own touchdown. There is no way Jesus could root for anyone other than Tebow (and the Gators). Honestly. Not going to happen. That is great that you feel that way, Tyler, but we need to know your reasoning! -We know that Jesus already blessed Marty Tadman enough that Boise State beat Oklahoma in 2006. -We know that Jesus already blessed Tim Tebow by making him the youngest player to win a Heisman and he's also already won a championship. -We know that Jesus blessed Sam Bradford with a Heisman. Tonight's blessing can go either way, but I will certainly be pray for Tim Tebow to become thrice blessed. Ferow sets up the play...fakes a lateral to Johnson, is he gonna go for it? No, he feints to the left...now to the right! He see's the open man...but no! It's a hand off to Jesus! He's at the 50...the 40...the 30...15...5...TOUCHDOWN!!! Ladies and gentlemen this game has been nothing short of a miracle!! Jesus: "Gimme the rock, yo." Kid: "But Jesus, you're in front of me. That's a forward lateral." Jesus: "Gimme the rock. I'll bend space. Don't worry. Also, I'm especially fond of the two guys in the background who are frolicking arm in arm." 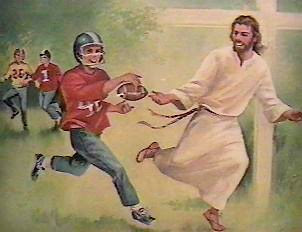 Optional Caption: "Jesus Catches a Hail Mary"
Caption: "Pick it up kid ... I can keep up with you in a pair of sandals." fast forward 2 the present and you can see that obviously Jesus liked Sam better than Tebow. FYI: God's all time favorite team is the Cincinnati Bengals!